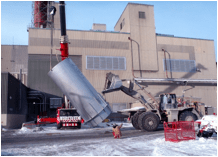 January 2012 saw the completion of an intensive engineering project that Noise Solutions was chosen to carry out for Lafarge, North America’s largest diversified supplier of construction materials. 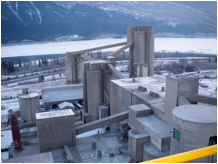 Extensive research for the project at the cement plant in Exshaw, Alberta, Canada began in 2009. This included exploring a combination of active noise control scenarios, as well as conducting monitoring surveys at four nearby residential located 240 to 500 meters from the plant. The surveys revealed that the Exshaw facility was not in compliance with the Energy Resources Conservation Board’s (now the Alberta Energy Regulator) permissible nighttime sound levels of 48 dBA. One of the largest noise sources at the Lafarge Cement Plant was the K5 Gravel Bed Filter Stack, which is essentially a giant chimney. 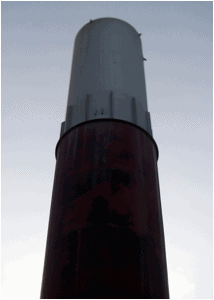 After more than a year of collecting data, modeling, engineering and manufacturing, Noise Solutions installed a massive 14,500lb, 25 foot tall stack silencer, designed to absorb noise-causing vibrations from one of the stacks. 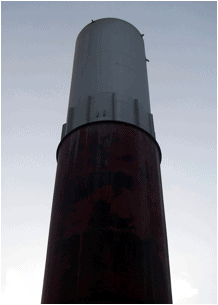 The installation, which also included 13 silencer modules on three large roof vents, was highlighted as a priority to Lafarge as a result of forum discussions from both plant employees and residents in the Exshaw community. These ongoing discussions eventually launched the Community Liaison Committee, which included eight members of the public and three of the plant’s senior management staff, to ensure better communication and enhance public perception of the plant’s operations within the community. 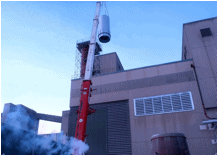 Noise Solutions unparalleled turnkey operation has once again achieved success at providing innovative noise control to create balance and harmony between industry and community. Large-scale custom engineering jobs, such as this one with Larfarge, or the work Noise Solutions has already completed with NASA and the ASRC Federal Space and Defense (formerly ASRC Aerospace and ASRC Management Services) has given these skilled professionals an extensive repertoire of experience when faced with complicated or unorthodox scenarios.